To all the commenters who reply, "Judge not" and "Did you go to her?" Some believers are given a heightened ability to discern by virtue of possessing a gift from the Spirit. and to another the effecting of miracles, and to another prophecy, and to another the distinguishing of spirits, to another various kinds of tongues, and to another the interpretation of tongues. (1 Corinthians 12:10). For spirit-gifted discerning believers AND all others, we must practice discernment in our walk. (Hebrews 5:14). That means both identifying it AND acting on it. It's non-negotiable. Where does God command believers to exercise spiritual discernment? Perhaps a better question is, where doesn't He? The answer is Philemon. Of all the books in the New Testament, this letter of twenty-five verses is the only one in which there is no instruction for the believer to be on guard against falsehood. All remaining twenty-six books of the New Testament (and many of the Old Testament) exhort the believer, to a greater or lesser degree, to discern truth from falsehood and to act upon it. If your brother sins against you, go and tell him his fault, between you and him alone. (Matthew 18:15). Be nice. Jesus ate with sinners, you know. -- they hypocritically have failed to follow their own advice and 'come to me privately', and to 'judge not'. Wise people treasure knowledge, but the babbling of a fool invites disaster. (Proverbs 10:14). Judge not, that ye be not judged. (Matthew 7:1). Judge not can't mean do not judge, because in John 7:24 we're told to judge. Wisdom would suggest that rather than there being an inconsistency in the Bible, there is an inconsistency in our understanding. Do not judge so that you will not be judged. For in the way you judge, you will be judged; and by your standard of measure, it will be measured to you. Why do you look at the speck that is in your brother’s eye, but do not notice the log that is in your own eye? Or how can you say to your brother, ‘Let me take the speck out of your eye,’ and behold, the log is in your own eye? You hypocrite, first take the log out of your own eye, and then you will see clearly to take the speck out of your brother’s eye. It means when we do have to judge something, as in test, discern, check, etc, do not do so hypocritically, harshly, or wrongly. More here: GotQuestions- What does the Bible mean that we are not to judge others? If a commenter reads one of my discernment essays and ignores the scriptures, the facts, and/or the point, but gently or harshly or anywhere in between, urges me to "judge not", I will delete the comment but reply by pointing her to this essay. 2. Have you gone to her privately? This verse is about church discipline, when one member of a local body has sinned against another person in the local body. It is a local, internal procedure. It is not referring to our response to book reviews or other public statements false teachers have made. It would be a serious mistake to imagine that a private meeting is always a mandatory prerequisite before any Christian can legitimately express public criticism of another believer's published work or public behavior. On the contrary, sometimes—especially when we're dealing with a public and scandalous transgression—open rebuke may be warranted as a first response (cf. Galatians 2:11-14). Matthew 18:15-17 outlines instructions for dealing with private sins and personal offenses. These are not guidelines for dealing with false teaching or public behavior that might cloud the truth of the gospel or besmirch the reputation of the whole church. Here is Tim Challies with an easy button version of Don Carson's essay on Matthew 18 abuse. If a commenter reads one of my discernment essays and ignores the scriptures, the facts, and/or the point, but gently or harshly or anywhere in between, urges me to "go to her privately", I will delete the comment but reply by pointing her to this essay. Strangely, in a third most abused verse in the discernment world, many of them say 'Be nice. Don't condemn. Jesus ate with sinners.' What they are referring to is Mark 2:16. If you think about it, you realize how massively ridiculous their statement that one should not cry out against false teachers or false doctrine is. The only sinless person who ever lived was Jesus. Of COURSE He ate with sinners. He ate with sinners every time He ate. Jesus eating with sinners verse was about the Pharisees complaining that Jesus was eating with tax collectors and prostitutes whom the Pharisees believed were "sinners", outcasts unworthy to be in polite society, while at the same time believing that they themselves were NOT sinners and worthy to eat with Jesus. Jesus ate with sinners, having compassion on them, because they were lost sheep. However He never expected them to remain in their sin. He told the adulteress to 'go and sin no more,' for example. He also was very harsh with many other sinners. He whipped up a fury against the merchant greed-mongers in the temple. He called the Pharisees blind guides, fools, wicked, and greedy. Of course we (forgiven) sinners will eat with (unforgiven) sinners because we are to be in the world. But if we see a friend involved in a false doctrine, do we take their food but leave them with a poison in their soul? No. As precious as this truth is—that Jesus is a friend of sinners—it, like every other precious truth in the Bible, needs to be safeguarded against doctrinal and ethical error. It is all too easy, and amazingly common, for Christians (or non-Christians) to take the general truth that Jesus was a friend of sinners and twist it all out of biblical recognition. If a commenter reads one of my discernment essays and ignores the scriptures, the facts, and/or the point, but gently or harshly or anywhere in between, urges me to "judge not", I will delete the comment but reply by pointing her to this essay - and urge her to read the beginning section about the importance of discernment. People ask me this all the time, “What is the greatest need in the church today? What is the most compelling need? What do you see as the biggest problem in Christianity? The biggest problem in the church? It's simple for me to answer that. 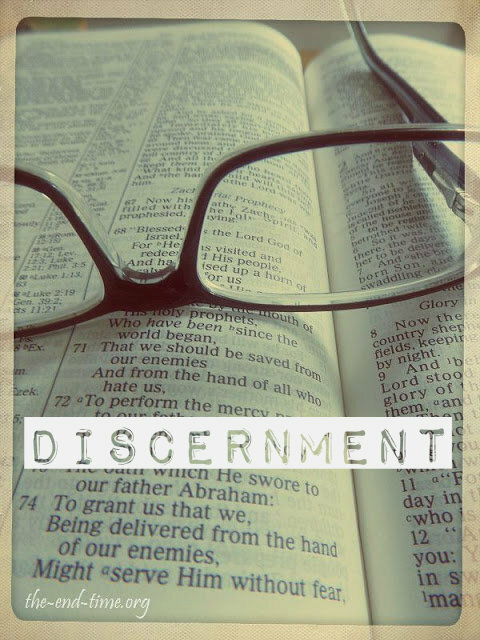 The biggest problem in the church today is the absence of discernment. It's a lack of discernment. It's the biggest problem with Christian people, they make bad choices. They accept the wrong thing. They accept the wrong theology. The are prone to the wrong teaching. They're unwise in who they follow, what they listen to and what they read. ~John MacArthur, 2002. What they really mean is, "Touch not my idol." well said. my favorite defense on "do not judge" is actually v.6...how do we recognize swine if not for discernment (judge)? Please continue to name and call out the false teachers and preachers. These folks are contributing substantially to the apostasy that has arisen in the Church of the Lord Jesus Christ. Kenneth Copeland's teaching, for example, that we are little gods and that the Lord God can't do anything on earth without our permission, is simply a heinous teaching, false--and more than that--a lie. I believe that many of these false teachers are going to be among the people that, at the Judgments, will not be before the Lord to receive rewards, but will be among those of whom Jesus will say, "Depart from me . . . I never knew you." We cannot afford to have these false teachers presenting their error without being challenged. They may well be dragging people into hell with them. That kind of confrontation and challenge does not require tea-party negotiation and refutation. It takes straight-on challenge. And, by the way, those who attempt to assuage the feelings of the criticized false teachers may well be complicit in the condemnation of many who were misled by these false teachers. Thank you for your honesty and straightforwardness.